The area rug is available in 2'*3'. 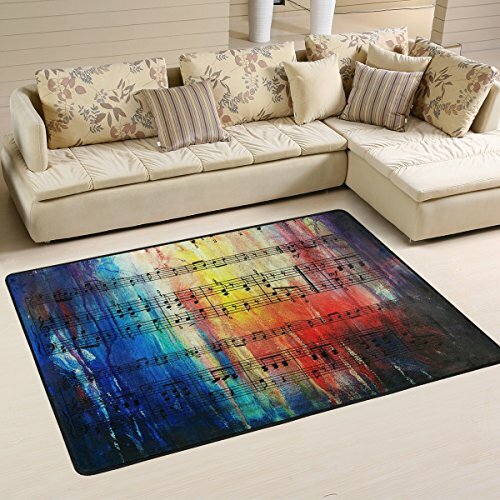 Our area rug are made of high quality and durable polyester. Middle: high-density memory sponge, effectively alleviate the foot pressure. Bottom: non-woven fabric, which is non slip. Our area rug is mainly used in your living room, dining room, bedroom, playroom, kids rooms. It can decor or your home when halloween/christmas/thanksgiving/easter, ect. It's also can dress up your bedroom. Our area rug can protect your floor very well. It's also a good choice to send it as a holiday or housewarming gift. Material: polyester, sponge, non-woven fabric which are soft touch, wear-resistant and non slip. Occassion: the area rug works in the kids room, living room, bedroom, dining room, dorm room, kitchen, hallway, entryway or hardwood floors. Function: decor your home when holiday or themed party. It's also a a ideal festival/housewarming gifts. Design: personalized area rug can show off you unique character. If you have any questions about this product by Naanle, contact us by completing and submitting the form below. If you are looking for a specif part number, please include it with your message.